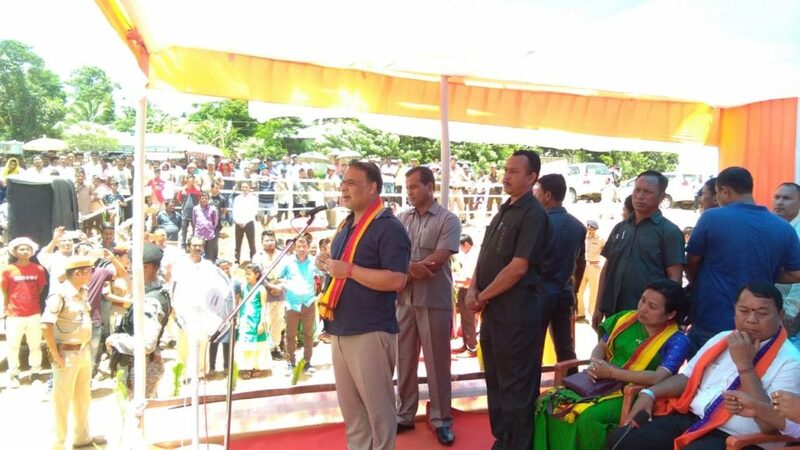 Assam Finance and Health Minister Himanta Biswa Sarma has arrived at Haflong on a two-day visit to the hill district of Dima Hasao in Assam on Tuesday. Before arriving at Haflong, the Minister had a brief stop-over at Langting in the district where he inaugurated a new Srabajanin Durga Bari (a community Durga Puja permanent pandal). The function was attended by Assam Hill Areas Development Minister Sum Ronghang; Chief Executive Member (CEM) of North Cachar Hills Autonomous Council, Debolal Garlosa; BJP legislator of Haflong Birbhadra Hagjer; chairperson of the NC Hills Autonomous Council Ranu Langthasa; among others. Dr Himanta Biswa Sarma also addressed the gathering after the inauguration. Speaking on the occasion, Dr Sarma said that the Bharatiya Janata Party (BJP) is a political party guided by ideals and principles. Taking a dig at the erstwhile Congress Government in the State, Dr Sarma also said that the previous governments have never attributed importance to the hill state. He said, it is only the BJP took over the reins at Dispur, the process of development has slowly begun. The Minister travelled by road through Maibang to Haflong. He was accorded a warm reception by party workers at Mahur on the way. Notably, the Minister will have meetings with the BJP workers of the district and also with the CEM of the autonomous council. Dr Sarma will also have a meeting with concerned department officials of the district. The Minister will also have separate meetings with the representatives of the apex bodies of the indigenous groups of the district. A slew of government programmes have been lined during Dr Sarma’s visit. On the other hand, Asom Gana Parishad (AGP) leader Atul Bora and Minister Keshab Mahanta are also arriving at Haflong later in the day. The two AGP leaders will take part at a workers’ rally of the party at Haflong on Tuesday.